Can Separate Faucets for Hot & Cold Water Be Merged Into One? The variety of plumbing products available will allow conversion between different faucet configurations in most modern lavatories and kitchen sinks. You will need to check your sink measurements and be prepared to do some searching. Water mixes above the sink deck in this old-fashioned bridge faucet. Before attempting a conversion from dual faucets to a single faucet, inspect the sink or lavatory. Determine whether there are two or three holes cut in the deck of the sink, and measure the distance from center to center of the two holes on the outside, which is the "spread" Standard kitchen sinks have an 8-inch spread, and bathroom lavatories have either a 4- or 8-inch spread; anything wider than standard may require custom fittings. The only way to convert dual faucets to a single spout with this configuration is by installing a bridge faucet. Water from the two valves, or handles, flows through pipes above the sink deck to a spout mounted in the middle. You must specify the spread when selecting a bridge faucet. If there is a third hole centered between the faucets, you may convert to a two-handle faucet with a central spout or a single-handle faucet. The single-handle faucet installs with a deck that covers the outer holes. 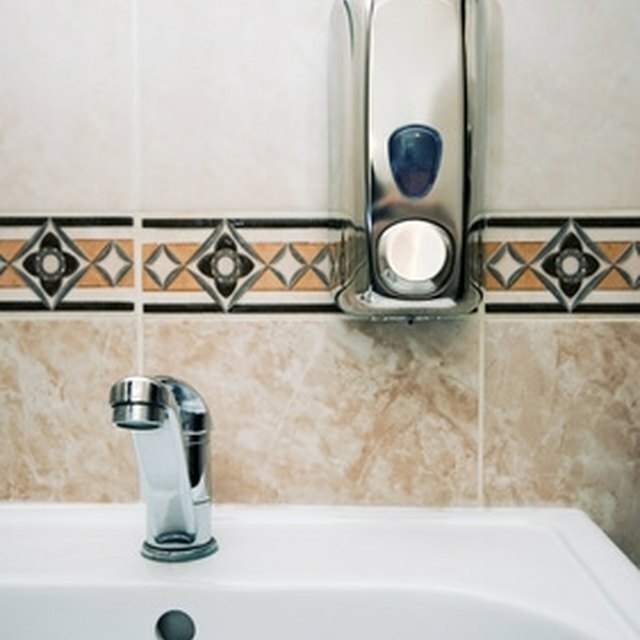 For bathroom lavatories, note the spread of the outer holes when selecting a replacement faucet. These faucets can also be replaced with a type of bridge faucet. Be certain to select one that is designed for wall installation; otherwise, the spout will point back toward the wall. How Do I Replace a Delta Monitor Tub Spout with Diverter Stem?